Max Occupancy: 4 Oriental Queen Suite with its large oriental black Bombay chest, oversized full length mirror, and yellow secretary warm the hearts of the guest that are staying in the elegant accommodation. 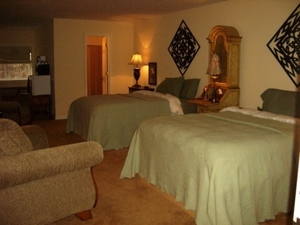 "I thoroughly enjoyed my stay at the Cart Barn Inn. A nice place to relax, it’s next best thing to being at home"